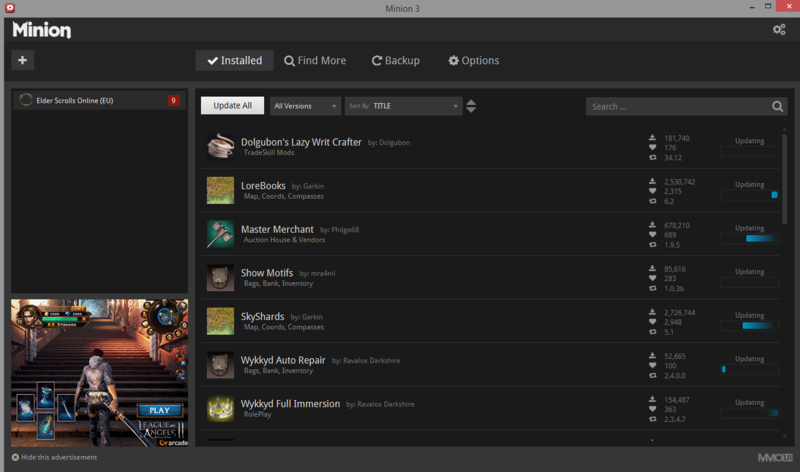 My problem currently is the fact, that Minion won't update my Addons or install new ones. I used to have Auto update turned on, but have since turned that off. I have had this problem since One Tamriel came out and I can't figure out how to fix it. It haven't really been a problem till now, since my chat log in constantly spammed with. "Update your Addons"
I have checked for Minion running multipul times and restarted after turning "Auto update" off, but it still dosen't download or update anything. Did you try to reset the addon detection, redetect the game and addon folders? You can achieve this by using the settings located at the top right corner of minion (gear-wheel icon). I had not tired it before this, but I just tried it now. I clicked the two top once, for redetecting addons and games. But nothing really seemed to happen. and it still can't update. Minion is getting (Access is denied) when trying to write the new updated addons to C:\Users\Carsten\Documents\Elder Scrolls Online\live\AddOns\ . Close Minion. Then on the icon right click and choose "Run as administrator", does it work now? Some reason your windows permissions on the AddOns folder isn't allowing Minion to write to it using default privileges. Added a ticket to our backlog to have Minion detect this issue and prompt users about the problem and possibly prompt to elevate privileges. Last edited by Dolby : 02/15/17 at 04:38 PM. I was hoping it might work. But sadly after turning minion off and starting it as Admin it still just stood there and did not update. Can you post your minion.log again, interested to see what it says now that it has admin privileges? Right I am not sure if this was okay. But my Log file was 2.2mb large so the site would not let me upload it. I put it on filedropper instead. You should see a bunch of folders which is good but do you see a bunch of .zip files too? If you see a bunch of zip files delete them. Restart Minion and try updating again. Let me know if you see zip files in the AddOns folder either way. The errors in the log now are saying Minion can't overwrite the zipfiles it previously downloaded due to permission issues. The .log file should compress well, so you could also zip it before you attach it here. Last edited by Dolby : 02/16/17 at 02:54 PM. I could not find anything in the Live folders. I did however find a Zip file in the LiveEU that was created when one Tamriel just came out. But I removed that, restarted and ran as admin and that did nothing really. liveEU folder is not valid anymore as with OneTamriel live + liveu got changed to just "live". Are you able to copy files to that AddOn folder? Wondering if you even have permission to write that folder or maybe some how the ESO AddOn folder is locked or corrupted. Download an AddOn manually and move it there or really any file you have handy. Does it stay there or do you get a permissions error? I moved some files from LiveEU to Live and had no problems if that, I made a new document and moved that in there with no problems. This is very strange as the minion.log is saying its experiencing (Access is denied) when it tries to write the AddOn zip files to your AddOn folder. Do you have a security program other than the windows default one that could possibly be blocking Minion from writing to that folder? Maybe Minion is not executed with administartor rights correctly? Be sure to right click the minion link and say "Run as administrator". And yes I am sure I right clicked and pressed run as admin, still did not work. It is definitely one of Bitdefenders new "features". This also can be a problem when saving for some programs or games. Because of this thread and my own experiences with Bitdefender I was able to track the bug down. I do not have the english version of bitdefender, so I have to guess how the "feature" is called there, but I will try. Go to the BD icon in the info field. Right click and choose "show" (Anzeigen). On the window that opens, choose "show functions" (Funktionen anzeigen). It is approximately in the middle of the window on its right side. Just a text with the > symbol. On the next screen deactivate the "safe files" (sichere Dateien) option. It is the bottom right field. Shortly after I installed Bitdefender I played Fallout 4. I played about 3 to 4 hours, saving some times because I was building a settlement. A day afterwards I tried to load the safe game. But imagine my surprise as I found nothing of my recent built buldings. At first I imagined a failure in loading the latest safe game. But after some searching I found there simply were no safes I made. Well, maybe a bug ffrom the latest Bethesda update, I thought. Then, I came to safe a file from an email to one of windows standard folders (music, videos, downloads, documents,...). But it also did not work. That made me think and I checked Bitdefenders logs. There I found the reason. "Safe files" is blocking every writing access to windows standard user folders. I already told their support that this "feature" has more of a bug, but well, companys. They will just learn when some other company will sue them because some of their work is blocked from saving states. Same problem here but I'm not using Bit Defender. I'll try to temporary disabling Avira. EDIT: I've added minion folders to exception and now it works fine. Last edited by Nev3rmore : 01/02/18 at 04:08 AM. I have tried uninstalling and reinstalling everything. I've tried force refresh. I checked to make sure anti-virus was letting it through. I made sure there were no .exe's. Attached is the log file and a screenshot.